In the eight seasons at the helm of Pitt Basketball, Jamie Dixon has led the Panthers to eight consecutive NCAA Tournaments; including three Sweet Sixteen appearances. The success of his program comes from the focus on the defensive end of the floor. In this on-court demonstration, Coach Dixon teaches you everything you need to know about man-to-man defense. 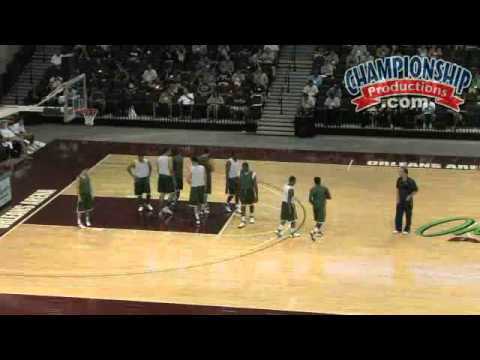 Watch as he demonstrates how to guard some of the most used offensive tactics in basketball. Man-to-man defense is the backbone of Jamie Dixon's program. See how his intense ball pressure and the "help in the gaps" forces the offense out of their rhythm. Dixon's goal is to get the offense to shoot below 40% and to win the rebounding margin by 10 every game. Dixon covers the terminology he uses with his players, such as stunting, pinching and helping the help man. These defensive principals will position your players to defend any cut or screen that the offense is throwing at them. Create more turnovers and improve your team's overall defensive success with these effective tools from Jamie Dixon! Produced at the Spring 2011 Las Vegas clinic.